Northern Inuits are a rare breed here in the US having risen to fame in the last couple of years. 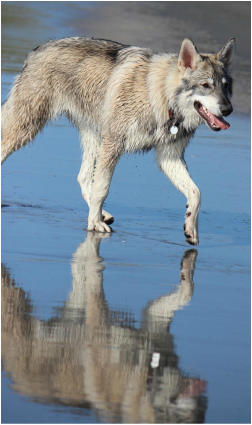 Originally from the UK, this breed somewhat resembles wolves or wolf hybrids (I get stopped constantly and am asked if Madigan is a wolf hybrid). That being said they are not wolves and they are not wolf hybrids. Nor are they huskies, malamutes, or albino german shepherd dogs. Northern Inuits are very intelligent and loyal. They are completely non aggressive and are very versatile. They are not for novice owners as they are incredibly quick witted and can be very stubborn when they want to be. The owner of a Northern Inuit must be the alpha member of the pack or face becoming the underdog, in which case your dog will take advantage of you (They are that crafty!). I've been told that nice yards or garden don't mix well with this breed, however Madigan has proven time and time again that she doesn't like to dig or get her paws dirty (spoiled princess). This breed does however like to eat any variety of garden plant so future owners beware. Some Northern Inuits are subject to their prey drives. If introduced to livestock at an early age, most will grow out of it. However, two or more N.I. 's together become a pack and then their pack instinct will take over. Common sense dictates that you should never leave unsupervised children with dogs. Northern Inuits can be boisterous when at play and sometimes like to 'mouth' things like arms and hands. Northern Inuits do not like being left alone and can often suffer from separation anxiety. During these times they are likely to destroy anything in the immediate vicinity, including chairs, couches, doors, walls, carpets, rugs, shoes, end tables, and table legs. The best solution for this is to insure that your dog is never left alone for long periods at a time. Having another dog, as a companion is also a great idea as Northern Inuits are very sociable and love the company of other dogs and people. Which brings me to my final point about this wonderful breed. BEWARE THESE DOGS ARE INCREDIBLY ADDICTIVE. You may think I jest but in actuality once you have one it isn't very long before you are dying to get another. Most people tend to have more than one. So, you've been warned. Please make sure to always buy from a breeder that is recognized by the Northern Inuit society. 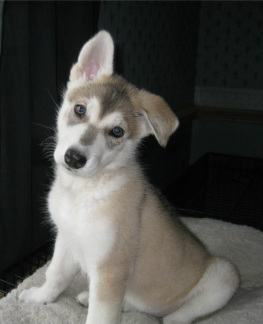 There are people out there who only want to make a profit due to this breeds recent popularity and are selling cross breeds or even hybrids as Northern Inuits. To ensure you get a registered puppy please do your research and choose a breeder who is registered with the NI Society.